Beautiful eyes are in every woman’s must have list but to make your eyes stand out you need to have the perfect eye makeup look ready. 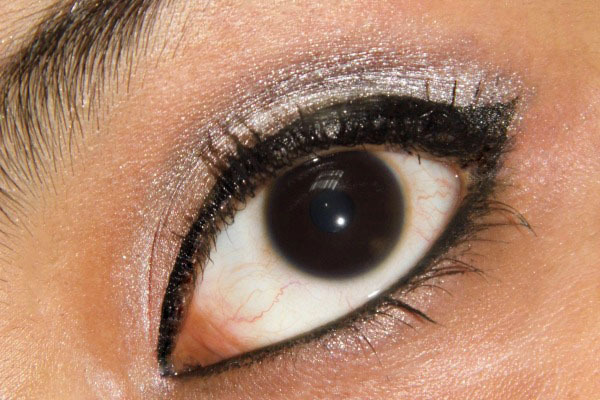 Eye makeup can be done very easily and without much practice. 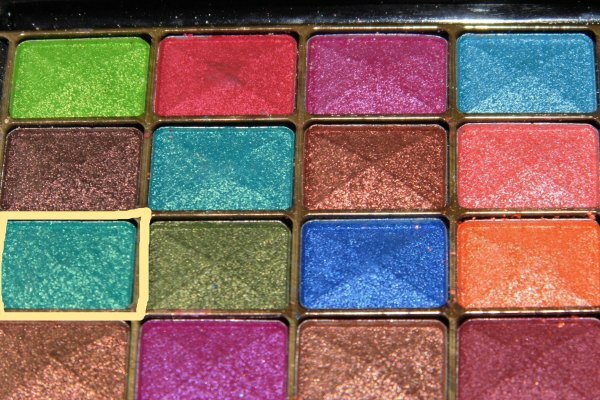 All you need are a basic set of colors and tools and you are ready to recreate your favorite eye makeup. 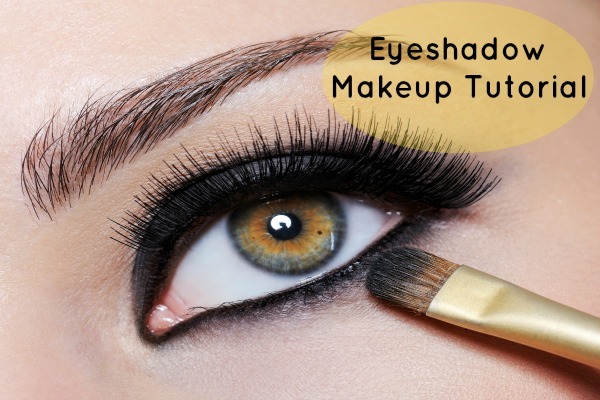 Today we show you three of the most common and useful eye makeup tutorial which can be done by anyone and will be useful on a daily basis. 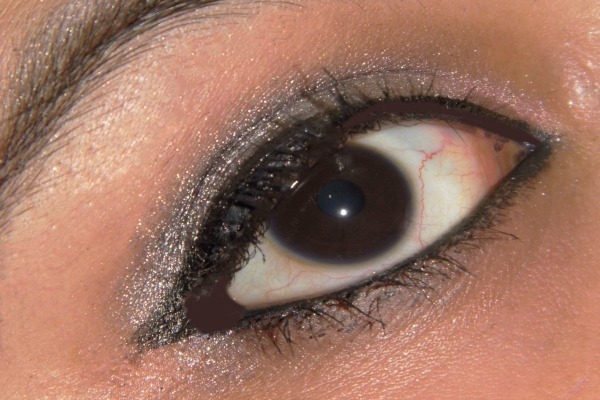 Smokey eyes are one of the most common eye makeup looks used throughout the world. 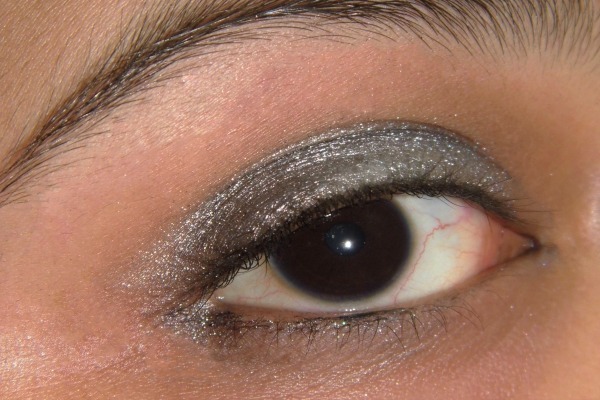 If you want to add drama to your eyes then the Smokey eye look is for you. This look is particularly good for evening and night occasions but if you want it can easily be toned down for the day. Apply the Primer to your lid and create the base for your shadow. If you are not aware of what an eye primer is then it’s a kind of base for your makeup and it makes the skin smoother and makes it a better canvas for eye makeup. 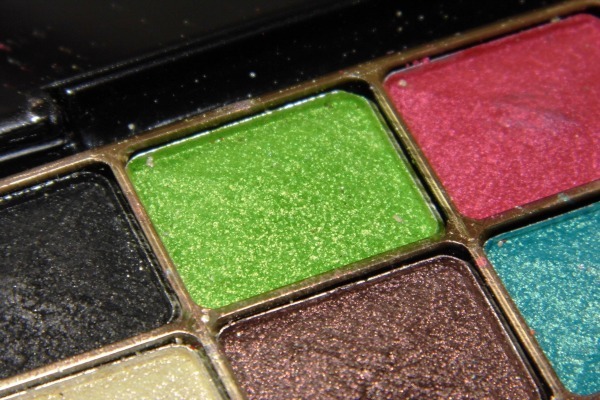 A good primer also makes the eye shadow shades pop and stay longer . 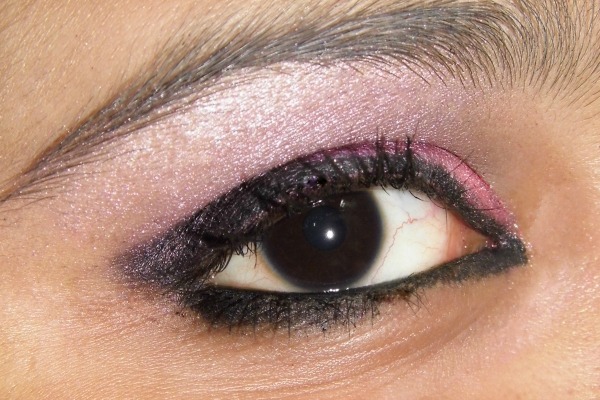 On the top lid outer corner take your smudgy kohl and apply it randomly. Do not go beyond the half of the lid. If you go too much near the crease line then it will be transferred to the upper part too. Keep applying the kohl and don’t worry about being perfect. Take a smudger or a small eyeshadow brush/ use your pinky finger to slightly spread the kohl to the outer 2/3rd of the lid. Keep fading it towards the crease. 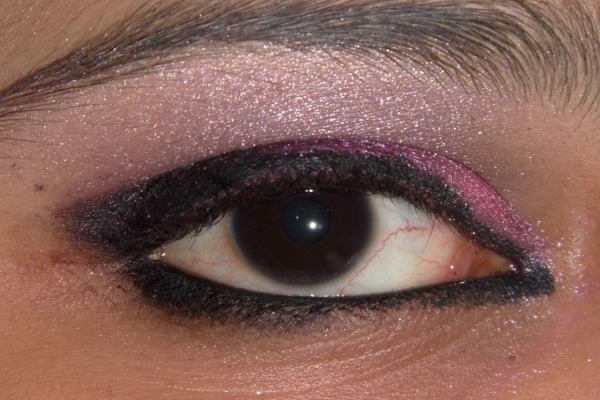 If you feel the intensity has become too less,then use a bit of more kohl to get even on both eye lids. 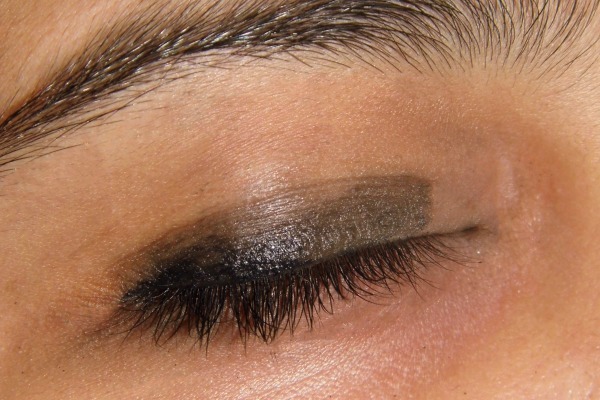 Use a black matte shadow on top of the kohl with a flat eye brush. Hold a pice of tissue below the lower lid to catch any fallaways. 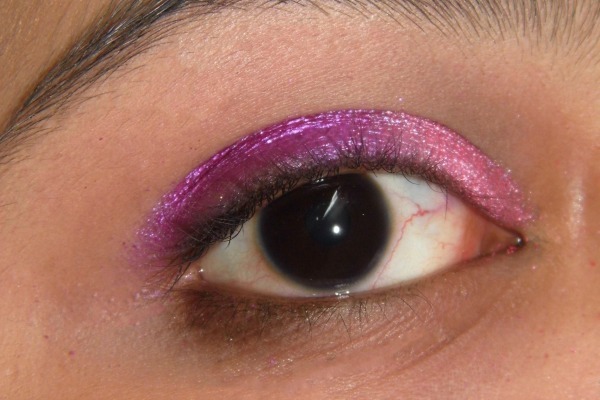 Apply the second shade to the inner 1/3rd of the Eyelid. 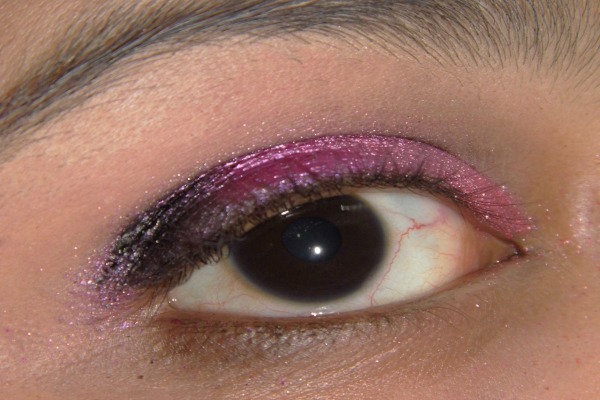 Use a flat brush to apply it from the tear duct area till the middle . Use your fluffy brush to blend the pale shade and the black eyeshadow with windshield wiper motions. Keep doing the wiper motion at the crease also to soften the edges that are harsh. Soon you will see that the pale shade and the black shade has mixed in the middle slightly. Take a small flat brush and use a bit of the highlighting shade on the brow bone. 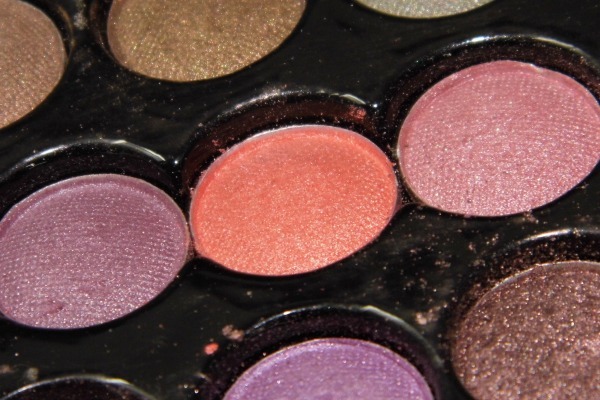 Use the same brush to gently blend it into the crease so that it looks good. You can also dab a bit of the highlighter near the tear duct. We used a light green shadow at the tear duct . But you may use a pale highlighting shade like gold or silver or beige. 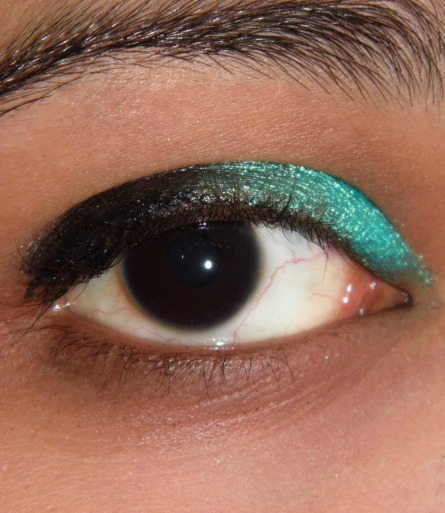 On the lower lid use a bit of black shadow near the waterline and blend it in with the paler shade applied in the front part of the waterline. Use a dark kohl to line your waterline and your tight line and apply two to three generous coats of mascara . Apply the Primer to your lid and create the base for your shadow. If you are not aware of what an eye primer is then it’s a kind of base for your makeup and it makes the skin smooth and makes it a better canvas for eye makeup. A good primer also makes the eye shadow shades pop and stay longer . 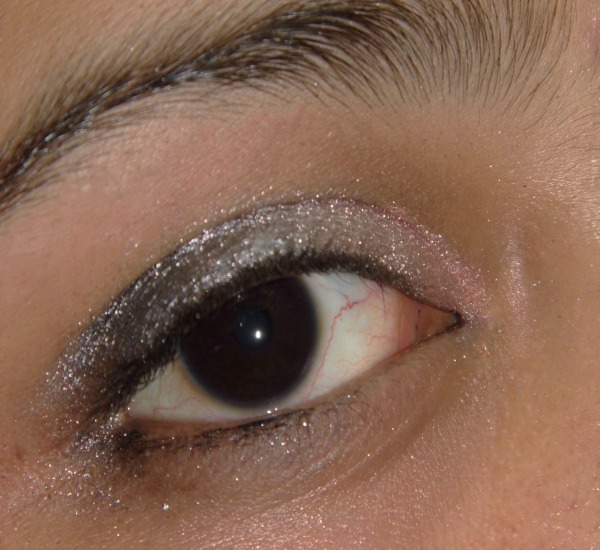 Apply a metallic Grey shade on the outer corner of the eyes. 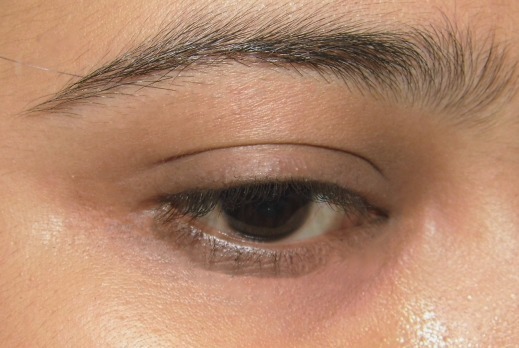 keep the shade restricted within the outer 2/3rd of the eyelid. Don’t let the shade go beyond the crease line. Now apply a pretty peach shade to the inner corner of the eyes. Use a fluffy brush to blend the peach shade into the grey one . 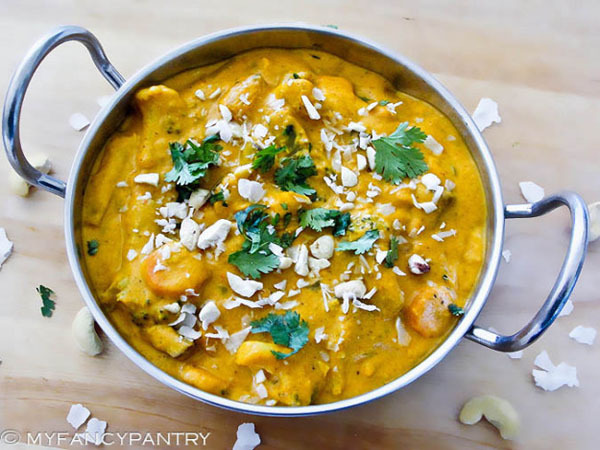 Use a bit more of the peach if it turns too pale. 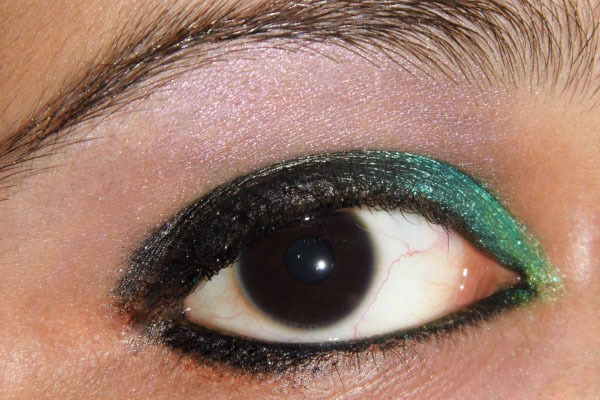 or use a bit of white eye pencil beneath to give the eyeshadow a lighter base. 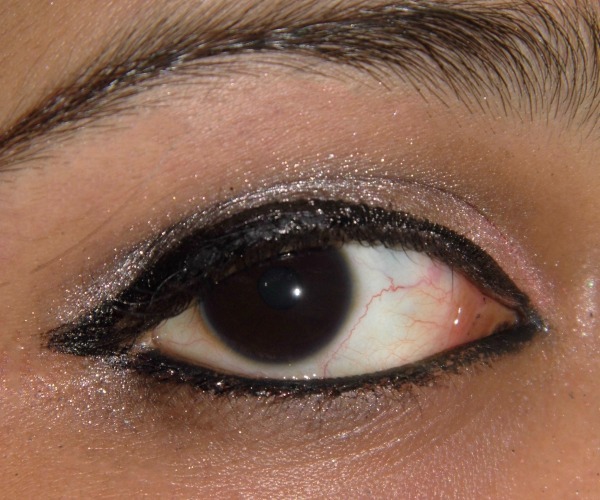 Now use gel liner or liquid liner to line the eyes and apply a thick line of kohl/liner to the waterline. Use a bit of highlighter on your Brow bone and you are done. We finished this off with a small flick added at the last step. Apply the Primer to your lid and create the base for your shadow. If you are not aware of what an eye primer is then it’s a kind of base for your makeup and it smooths the skin and makes it a better canvas for eye makeup. A good primer also makes the eye shadow shades pop and stay longer . 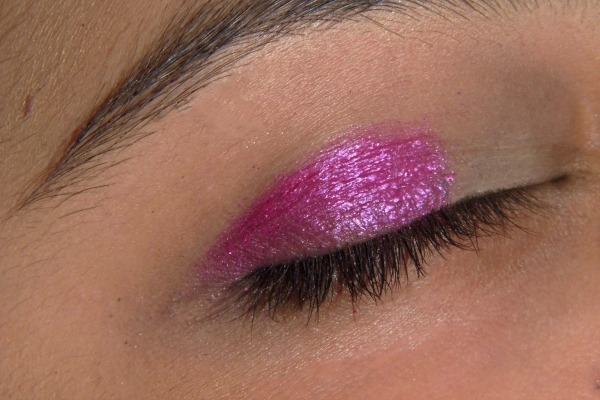 Apply a bright pink which will be the main color of the eye makeup.Use a flat top brush to gently pat the eyeshadow on to the eye lids. Now take a bright pink shade in a lighter tone and pat that at the inner 1/3rd and use a fluffy brush to mix the two shades up and get rid of any harsh lines. 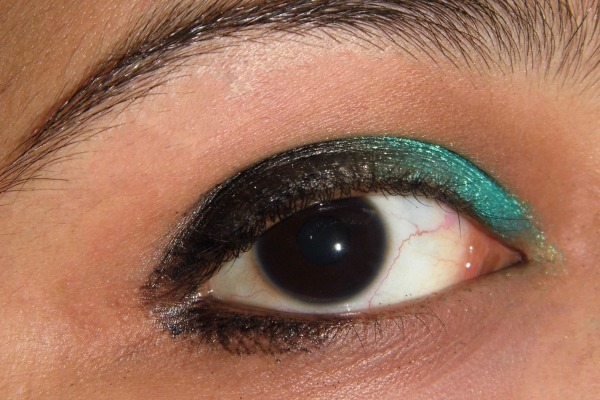 Now take a bit of black shadow onto an angled brush and apply to the outer v and into the crease . 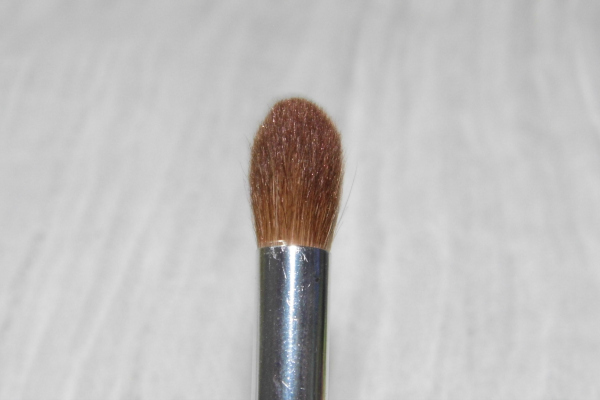 Use the fluffy brush to help make the crease shade blend in quickly. Now apply a highlighting shade onto the brow bone and blend with the crease well. 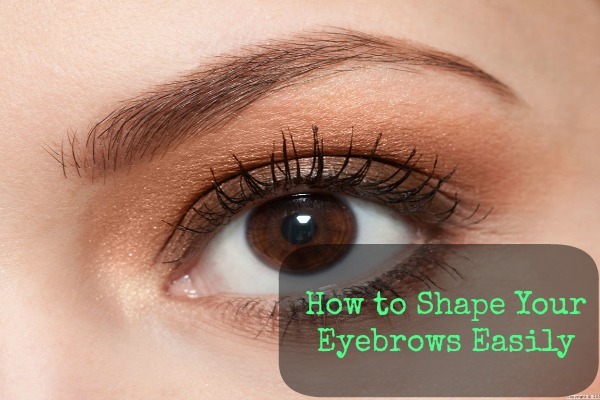 Don’t leave any harsh lines to make the eye makeup look beautiful. Apply thick line of liquid or gel liner and line your eyes.. Extend the liner towards the outer v . Don’t forget to use a thick line of kohl on the waterline and on the tight line too. USe a few generous coats of mascara and you are done. We hope you found these three looks easy and useful . If you try any of the looks do let us know below. If you have any feedback or suggestion do drop in a comment below.